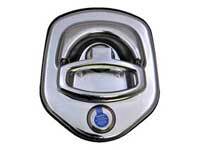 The Tool Box Paddle Latch Lock can be used as a tool box locks and latches or as a tool box lock replacement. They are designed for underbody tool boxes, under tray tool box, Rhino Tool Box locks, aluminum tool box locks and BOLT Lock Austrlalia is able to provide replacement toolbox lock set as we are a tool box lock supplier for tool box handles, latches and locks. Please select the Paddle Latch Lock for your vehicle or if you don't want to use your ignition key, BOLT Lock Australia provides the Key for FREE with your purchase of the BOLT Key Range. The Chyrsler & Dodge Paddle Latch Lock is compatible with the Chrysler - 300, Crossfire, Neon, PT Cruiser, Sebring, and Voyager Keys and the Dodge - Avenger, Caliber, Journey, Nitro and the Ram Pickup Keys. 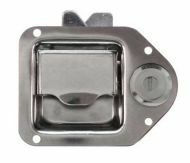 The Ford Paddle Latch Lock is compatible with the Ford - Escape, Explorer, F Series, Falcon, Fiesta, Focus, Kuga, Mondeo, Mustang, Ranger, Taurus, Territory and Transit Keys. The GMC & Chevrolet Paddle Latch Lock is compatible with the Chevrolet - Avlanche, Blazer, Camaro, Corvette, Silverado, Suburban, Tahoe Keys and the GMC - Sierra, Yukon Keys and the Cadillac - CTS and Escalade Keys. The Holden Paddle Latch Lock is compatible with the Holden - Colorado, Commodore VF, Equinox, Trailblazer, Trax and Ute Keys. The Jeep Paddle Latch Lock is compatible with the Jeep - Cherokee, Commander, Compass, Grand Cherokee, Patriot and Wrangler. The Mazda Paddle Latch Lock is compatible with the Mazda - Bravo (B Series), BT-50 and the Tribute Keys.